Although incomplete, Mozart's Mass in C minor, written in 1782, ranks as one of the outstanding Mass settings in European music history. This CD is thus the first recording of the definitive version of this new and intelligently edited reconstruction of Mozart's Mass in C minor. An introduction to the work is also included, now enabling this masterpiece to be approached from new perspectives. About the newly-created reconstruction by Clemens Kemme: Although incomplete, Mozart’s Mass in C minor, written in 1782, ranks as one of the outstanding Mass settings in European music history. The work has only been a part of performance practice since 1901, when the earliest attempt at a reconstruction was made; further attempts followed in 1956 and from the 1980s onwards, after all of the traditional sources had finally become available. Each of these versions is more or less successful in its own right, asking its own questions, and raising other doubts. The newly-created reconstruction/completion of the Mass by Clemens Kemme, finished only recently in the spring of 2018, confines itself to the original sources and avoids any arbitrary additions. The work was recorded in this critically acclaimed version for the Bayerischer Rundfunk during the summer of 2018, and was conducted by Howard Arman. This CD is thus the first recording of the definitive version of this new and intelligently edited reconstruction of Mozart’s Mass in C minor. An introduction to the work is also included, now enabling this masterpiece to be approached from new perspectives. About the work: In Vienna in the summer of 1782, Mozart started writing a new Mass despite having apparently received no commission to do so. On August 4, 1782 he married Constanze Mozart, and from his correspondence it appears that he had made himself a promise to “have a newly-composed mass performed in Salzburg if he brought her there as his wife.” The work may have been performed on October 26, 1783 in St. Peter’s Church in Salzburg, with Constanze as the soprano soloist; concrete evidence of such a performance is however lacking. Nevertheless, the Mass can probably be seen as a kind of votive offering for Constanze. The fact that the work was not completed may be due to the church music reforms implemented by the Emperor Joseph II, who preferred sacred music to be performed on a smaller scale. In 1785, Mozart eventually reworked the “Kyrie” and “Gloria” from the mass for his cantata Davide penitente. About the production: Recorded between July 30 and August 2, 2018, this BR studio production features an ensemble of high-quality soloists: Christina Landshamer(soprano), Anke Vondung(mezzo-soprano), Steve Davislim(tenor) and TobiasBerndt(baritone). The Bavarian Radio Chorusand the original-instrument Akademie für alte Musik Berlin are conducted by Howard Arman. 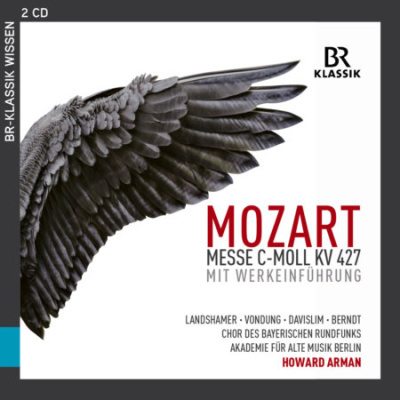 Introduction to the work: This recording of Mozart’s Mass in C minor is supplemented by the CD “Paths to Music”, an introduction to the work by Markus Vanhoefer, spoken by Hans Jürgen Stockerl, Norman Hacker, Franziska Ball and Katja Schild.